those two, but at the time, it was one of the best known Sunday pages around. It was the creation of cartoonist Charles Edward "Bunny" Schultze (Bunny having been a childhood nickname that stuck with him as an adult), who launched a strip called Herald Vaudeville at the same time but is mainly remembered for this one. It debuted on either January 7, 1900, as modern sources have it, or a week later, as reported by early comics historian Coulton Waugh (Dickie Dare). Its original venue was The New York Herald (The Timid Soul, Betty) but it moved to The New York American on February 16, 1902. The American was a Hearst paper, so if Schultze had stayed there long enough, his strip would have been among the first offerings of King Features Syndicate (which, by the way, much later handled the somewhat similarly-themed Grandma). 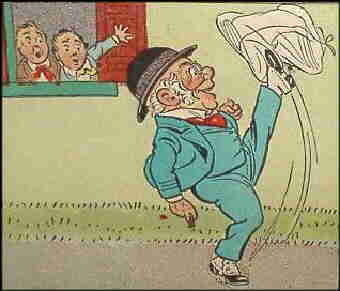 The basic premise was a reversal of the Katzenjammer Kids scenario — there, a pair of egregiously mischievous kids wrought havoc on the adults in their lives, but in this strip, it was Grandpa who did the havoc wreaking. His two grandsons, roughly ten years old, may try to put one over on him from time to time, but they seldom succeeded. Grandpa didn't just have the brains (combined with a properly perverse sense of humor) to reverse their attempts — he also displayed an amazing level of skill at acrobatics, illustration, construction of various small devices, and in many other areas. Schultze's drawing style seems a bit stiff by modern cartooning standards, but there was something about it that simply made the readers smile. He "drew funny", as one critic put it. A particularly good example is the design of Grandpa, whose eyes appeared large and round behind his pince-nez; and whose broad, open-mouthed smile, combined with the glasses, often made him look like a grinning, staring lunatic. Foxy Grandpa quickly moved out into books, appearing in reprint form as early as 1901. Between then and 1917, more than 30 volumes came out, from four different publishers. In 1902, a musical comedy about him appeared on Broadway — and the sets of the Broadway production were recycled in a series of eight live-action silent movie shorts released by The Biograph Company (which also did shorts about Alphonse & Gaston), also in 1902, in which Joseph Hart starred as Grandpa. Much later, he turned up in the first newsstand periodical in America devoted entirely to comics, The Funnies, a tabloid-size anthology that came out in 1929. The character never made it into animation, however, because he'd lapsed into obscurity by the time animation technology reached a point where commercial exploitation of characters like him became possible. The schtick seems to have grown a bit stale over the next few years, as the character's popularity dropped off. Hearst moved it from the regular Sunday comics to the back pages of American Weekly, his magazine section, where it often got crowded out. About 1910, he dropped it altogether. Schultze managed to place it in the less prestigious New York Press, but there, too, it was sometimes left out for lack of space. Starting in 1912, it was briefly distributed by The C.J. Mar Syndicate. It was dropped in 1918. Shortly after, Schultze launched a series of nature stories called Foxy Grandpa's Stories, which was distributed by Newspaper Feature Syndicate. There, Grandpa was merely a narrator, appearing in a one-panel cartoon at the top of each column. This feature lasted through the 1920s, and well into the '30s. Schultze died in 1939. By that time, the original strip's title had become a popular expression to describe a sly old man who likes to play tricks on his descendants. Like "Keeping Up with the Joneses", it survived the demise of the comic it was based on. Unlike that one, it faded from use after a couple of generations. Today, there's not much left of Foxy Grandpa — just some carefully preserved old newsprint, full of funny but very dated-looking artwork. Text ©2002-07 Donald D. Markstein. Art ©: Foxy Grandpa is in the public domain. This image has been modified. Modified version © Donald D. Markstein.